Accomplished hotelier, John Philipson became part of Six Senses Resorts Hotels Spas as Managing Director in the Maldives overlooking several properties including the development of Six Senses Laamu in 2007. Shortly after this he became Managing Director for Thailand overlooking five properties, opening Yao Noi and Six Senses Sanctuary in Phuket. He subsequently became VP of Operations for Six Senses Hotels and Resorts for two years before settling on his current role in the Middle East. 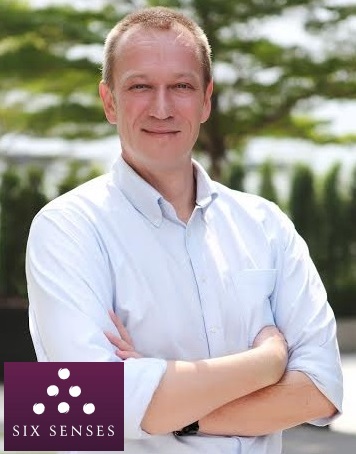 John has held a number of senior positions, including Food and Beverage Director and General Manager in several leading hotels around the world including RF Hotels Collection and Hyatt Hotels and Resorts. He began his professional career as an assistant front office manager in a luxury property in Grand Cayman and worked his way up to senior management level at several five-star properties including the Hyatt and Rocco Forte groups. John holds a Master of Science degree in Hospitality Management as well as a Bachelors of Applied Science from Southern New Hampshire University. He is Master Innholder and a Fellow of the Institute of Hospitality. John’s wealth of operational experience, as well as his business acumen and strong leadership skills, are important assets to further develop the resort and services, enhancing Six Senses resorts reputation as a unique and popular destinations for discerning global travelers. I am a strong believer that success is achieved through the people you manage. Hiring great talent is one thing but believe you have to be able to inspire, motivate and challenge to get the best out of them. Understanding individual strengths and weakness and taking personal responsibility for making them stronger and better at what they do. I love to see people grow and to and achieve things they never thought they could do. By showing a genuine concern for them and their needs brings great loyalty and passion. A relentless drive towards achieving perfection. I guess it’s a passion for never settling for what it is now and focusing more and what it could be. I have strong focus on attention to detail and delivering it constantly. Hotels and resorts are great in the fact that you are encouraged to keep evolving and there is not limit on what can be done or achieved if it enhances the product and guests experience. Continue to drive myself to keeping updated in regards to what’s happening in our industry and others and looking for new ways to change the dynamic and create innovation. I love travel and experiencing all that is out there. Regardless of product there are always things you can learn from the most basic to the most refined offering. The best way to stay ahead of the game is listen to your employees and guests. They are full of good ideas and recommendations and much of my innovation comes from asking them what they think about…or how would you feel if we implanted…they are our greatest fans and harshest critics. I would say the biggest success and one that brought me the greatest satisfaction is turning around two properties that had been open for a while and struggling to achieve their full potential. It is great to see that your actions and efforts can bring about change from a financial, customer and employee perspective as well as create iconic hotels for the future. Personal: To keep working through my travel and food bucket list and eventually find someone significant to do it with. Business: It would have to be to continue enjoying what I do. At present regardless of the hours I still wake up looking forward to the day ahead. But at the same time creating something that is uniquely you is always tempting such as a hotel offering or product. Creating something that has impact and creates a trend is always tempting. I think it would have to be the first hotel I was General Manager at the Rocco Forte St David’s Hotel and Spa in Cardiff Bay, Wales. It had just opened and took every ounce of effort and ability to get it on the right track and as a young manger you doubt and over analyze every decision you’re making as you’re doing so for the first time. Places a lot of unnecessary pressure on you as you feel responsible for so many thing such as the asset, the owners, the staff and the guests. Now you look back and smile and realize it was the making of me. Sometimes tough assignments make you a far better manager. Nature. I would not say I hug trees but often impressed and belittled by the awesomeness of Mother Nature. I tend to watch all the nature programs on TV like Planet Earth and the Blue Planet. If I was not an hotelier I would love to be a documentary maker getting to go to some amazing places on earth. It’s also the reason I enjoy Six Senses as they have a genuine commitment to preserving the areas we operate with a strong sense of sustainable tourism. My family, my friends, Winston Churchill, Nelson Mandela, many of my past bosses who taught me well. Everywhere but to narrow down Chapmans Peak, Cape Town, Koh Yao Noi Thailand, Angkor Wat Cambodia, Carmel California, Con Dao Vietnam. Anything Apple, Ralph Lauren, L’occitane, Timberland. Current and will always be food and travel. There is so much out there you can never get bored. I have wanted to work in hotels since my parents took me to The Carlton in Johannesburg when I was young for birthdays and was in awe of all the buzz and glamour. I was lucky enough to travel a lot with my parents when I was young and experience travel and gourmet food from an early age. Ever since thenit was what I wanted to do and as soon as I could studied and then worked. If you’re a people person or creative then there is no better job.